How was the Feel Good Period Club formed? Nikita Kapoor, a former University of Auckland Student, started Feel Good Period as part of an assignment for her marketing class. She decided to talk to some of Auckland’s homeless to get a better understanding of what their needs were. She mentioned how much of a struggle it is to have tampons or pads because it is not something that people actively donate. The Feel Good Period Club was developed through Velocity to run as a social enterprise but we are now focusing solely on running as a charitable club. This allows us to encourage active communication and discussion to change the taboo around menstruation as well as improve the accessibility of sanitary products for women in hardship. What are the aims of Feel Good Period Club? Feel Good Period aims to make everyone feel good about being human, feel good about their bodies and embrace who they are. We aim to break the stigma around menstruation and increase accessibility of sanitary products to those in need by hosting fundraising events and activities. Why does our society need a club like FGP? Our society needs to change, and FGP is helping to foster that change. Growing up, we’ve always shied away from openly discussing the topic of menstruation, even if it was just among girls. It never once occurred to us that this was a problem. We grew to learn the art of discretely passing pads to each other or hiding them in sleeves of jumpers as we walked to the bathrooms. And if our sleeves or pockets couldn’t fit them, we’d end up taking our whole bag with us to the toilet, so that we could avoid being seen pulling out a pad or a tampon in class. This secrecy never really bothered us too much growing up, we simply learned to accept it. We didn’t realise this was affecting our perception of ourselves. We were teaching ourselves that it was not important for other people to know our problems and our struggles and that it was shameful to talk about such a thing. New Zealand needs FGP because we are a club that is starting a movement to normalise the topic of menstruation. Homeless and refugee women and low decile school girls do not receive enough donations or support from the society because we as a society do not openly talk about this topic. We could all benefit from being more open to talk and discuss. 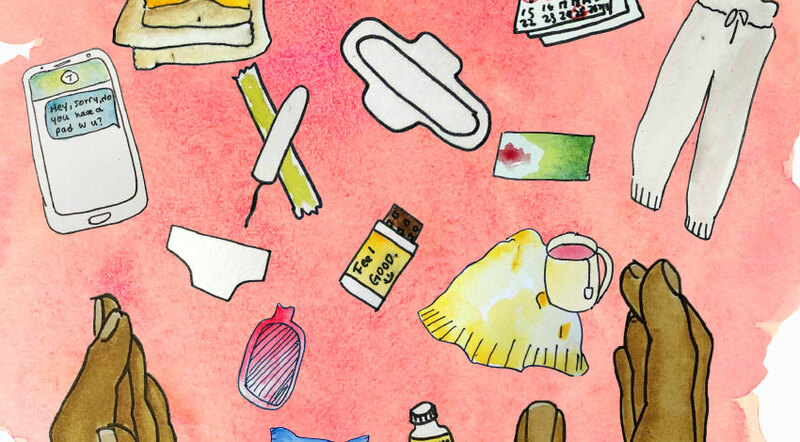 What does the Feel Good Period Club do? We host fundraising events that celebrate being human and help those in need have access to sanitary products. Our aim simply put, is to eradicate the stigma around menstruation and make you FEEL GOOD, period! All the donations and money raised are passed on to Women’s Refuge, Auckland City Mission and or low decile schools in Auckland. In our first semester, we hosted a movie night, a breakfast event, raffle giveaways and donated over 200 sanitary products to Wesley College with help from ‘Everlasting’ and. We hope to do even more this semester! What are some upcoming events that students can go to? For Semester Two, we have planned to host afternoon tea and talk sessions, yoga classes, boxing lessons, more movie nights, and raffle giveaways! We will be hosting a Tea and Biscuit Party on Tuesday (23rd July) 12 – 1 pm and a movie night screening She’s the Man on Thursday (26th July) 6:15 – 8:30 pm both in iSpace (Kate Edgar, Level 4) with an entry requirement: gold coin donation or donation of a sealed pack of sanitary products. We look forward to seeing you there! Everyone is welcome, you don’t have to be a student at UOA to participate. For updates on all our events and activities like and follow our Facebook page, Feel Good Period Club. You can also send us an email on “fgperiodclub@gmail.com” to sign up for our mailing list or share any ideas you have to help achieve our vision!